With more than a thousand years of history, Hanoi, the capital of Vietnam, boasts an extensive must-see itinerary that reflects its many years as the country's most important political center. You'll find places in Hanoi that reflect the full breadth of the Vietnamese cultural and historical experience, from the country's founding as a Chinese vassal state a thousand years in the past, to its liberation from French and American colonial powers in the 20th century, to its confident stride into the 21st. Don't say you've been to Hanoi in Vietnam until you've seen the majority of the sights on this list. This historic lake is the site of a foundational legend for Vietnam: Hồ Hoàn Kiếm means "Lake of the Returned Sword," alluding to the myth that a future emperor received a sword from a magic turtle at the lake's edge. The emperor later used the sword to drive the Chinese out of Vietnam. Today, Hoan Kiem Lake is a charming social and cultural center for Hanoi citizens—the lakeside is a favorite stop for couples' wedding photos and fitness buffs' morning workouts. The lakeside offers an excellent opportunity to take in the local color, and it's an easy walk to the Old Quarter afterward. A graceful, red-painted wooden bridge leads from the lakeside to Ngoc Son Temple, where devotees continue to perform their religious duties as they have been doing so for almost a thousand years. The Temple of Literature is a 1,000-year-old temple to education and site of the country's oldest university. Almost destroyed by war in the 20th century, restoration work has given the Temple much of its former glory back. It's laid out in a sequence of five courtyards from south to north, spanned by three pathways running through the Temple's length. The northernmost and last courtyard is the site of the former university for mandarins called Quoc Tu Giam, literally the "Temple of the King Who Distinguished Literature," established in 1076. Hanoi's Old Quarter is a short walk away from Hoan Kiem Lake and is the city's ultimate shopping hotspot. The Quarter's maze of streets offers a wealth of cheap shopping, delicious must-try dishes, and essential travel services. The Old Quarter is shaped like a triangle, with streets named after the goods sold in them. The place wears its age well: Visitors encounter narrow sidewalks and persistent shopkeepers imploring you to check out their stuff, covering a wide range from Chinese knockoffs to lacquerware to beautiful silk shirts. You can stay at any of some Old Quarter Hotels and backpacker hostels to find the area's shopping right at your feet when you wake up in the morning! "Uncle Ho" would have hated to see how he ended up; he had wanted to be cremated, not revered Soviet-style in a massive mausoleum on Ba Dinh Square next to the Presidential Palace, the One Pillar Pagoda, and a Ho Chi Minh Museum erected to his memory. But the people's will won over Uncle Ho's, and the Mausoleum opened to the public on Aug. 29, 1975. Inside the Mausoleum, Ho Chi Minh's preserved body lies in state under a glass case, with a military honor guard watching the visitors filing past. Visitors are allowed to pay their respects from 9 a.m. to 12 p.m., under strict rules: no photography, no shorts or miniskirts, and silence must be observed. After visiting Uncle Ho's final resting place, go next door to the Presidential Palace grounds and check out his living quarters; Ho Chi Minh's stilt house looks much the same as it did when he was still living there. Tour Hoa Lo Prison, the "Hanoi Hilton"
"Hoa Lo" literally means "stove;" the name is apt for a hell-hole of a prison built by the French in the 1880s and maintained till the end of the Vietnam War. This was the place American POWs sarcastically named "Hanoi Hilton," and it's where Sen. John McCain was confined when he was captured. His flight suit can still be seen here to this day. Most of Hoa Lo was demolished in the 1990s, but its southern part was preserved for posterity. Visitors can now see grisly exhibits showing the sufferings of the Vietnamese prisoners (and a highly sanitized depiction of the American POWs in the 1970s). Hanoi was hard-hit during the Vietnam War, and locals commemorate their hard-won victory through museums like Hoa Lo and others like it, like the Vietnam Museum of Revolution and the B-52 Victory Museum. The 18 hectares that make up the Hanoi Imperial Citadel are all that remains of what used to be an even more substantial agglomeration of three forts erected by Emperor Ly Thai To in 1011. In the 1800s, the French colonial masters decided to tear down most of the Citadel to make way for their structures. The Citadel they left behind now houses the Ministry of Defence, but the government has cannily left a few historic parts open to the public. The Forbidden City Wall and eight gates left over from the Nguyen Dynasty stand at the Citadel's perimeter, and after paying the VND 30,000 entrance fee (about USD 1.31), you can explore the rest at your leisure: the Flag Tower, the Kinh Thien Palace, and several others. The Vietnamese took France's coffee culture and made it their own: reinventing the French press into a uniquely Vietnamese drip filter called phin, and replacing cream with condensed milk. The resulting drink is hot, strong, and exceedingly sweet—the perfect fuel for a couple of hours' exploration of Hanoi's Old Quarter. Hanoi's coffee shops range from open-air streetside stalls to high-end air-conditioned establishments. To see both extremes mushed side-by-side in one place, head over to Hanoi's Trieu Viet Vuong, a tree-shaded lane packed with the most cafes per square meter in all of Vietnam. When you order coffee like a local, ask for hot, sweet, condensed-milky coffee by requesting "ca phe nau." If you like your cuppa black, ask for "ca phe den." But don't leave Hanoi without trying their famous egg coffee, "ca phe trung," where egg yolk and condensed milk are whipped together to make a sweet and airy head. By the rules of feng shui, the Emperors of the ancient Thang Long capital decreed the construction of four directional temples to block bad energy from flowing in. Collectively, Bach Ma, Voi Phuc, Kim Lien and Quan Thanh temples are referred to as Thang Long Tu Tran (the four guardians). Bach Ma Temple guards the east: Built in the 9th century, this is the oldest of the four, dedicated to a white horse that guided the site's construction. Voi Phuc Temple looks to the west, constructed in honor of a prince whose kneeling elephants helped him defeat invading Chinese forces. Kim Lien Temple ostensibly safeguards the south, despite its northernmost location relative to the rest. And the northern guardian Quan Thanh Temple, located on the shores of West Lake, is dedicated to a god who helps drive off evil spirits and foreign invaders alike. In gratitude for the temples' collective protection, Hanoians hold the annual Thang Long Tu Tran Festival in the spring. Converted to the Gregorian calendar, the festival takes place from March 9 to May 1, 2018, March 15 to April 20, 2019, and March 2 to April 8, 2020. Take a unique, bird's eye perspective on Vietnam's capital from the view deck of the Lotte Center Hanoi. Completed in 2014, the Lotte Center is the city's second-tallest building, which the management capitalizes on with a 360-degree viewpoint from its very top floor. Once you've gotten enough of looking around the city, test your agoraphobia at the Photo at Skywalk, where you can walk on a glass floor with a heart-stopping view of the 65 stories between you and the pavement. Afterward, slow down your rushing heartbeat one level up at the roof-deck bar. The view deck is open from 8:30 a.m. to 11 p.m. If you can't get enough out of a single visit, you can book a room at the Lotte Hanoi in the same building and get similar views. The abundance of water in Vietnam's rice fields led creative farmers to a brilliant idea: Using disused but waterlogged rice paddies to stage puppet shows. The water covers up the operating mechanism of the puppets, while the puppeteers work behind a black curtain, accompanied by traditional musicians. What Hanoi lacks in rice paddies, it more than compensates with a grand water puppet theater near the Old Quarter. The Thang Long Water Puppet Theatre caters to tourists and nostalgic locals with four shows daily, all year-round water puppet performances. The water puppets act out stories from Vietnamese village life and national legend. Unlike its rice-paddy-bound forebears, the Hanoi theater uses enhanced with modern smoke effects and lighting. Over 150,000 visitors watch this traditional Vietnamese art form at Thang Long every year. The Red River has been at the heart of trade and warfare for all of Hanoi's millennium-long history. Today, tourists can embark on a trip down its length to see the capital from a different viewpoint, and head on out to a few key sites just outside city limits. Gorgeous views of farmland pass by as you head east towards the Red River Delta and the sea. Along the way, you'll stop at historic temples like Chu Dong Tu in Hung Yen province; and traditional manufacturing villages like Bat Trang, in the business of producing high-quality porcelain for hundreds of years. Longer Red River cruises even go as far east as Ha Long Bay, or as far west as Hoa Binh (a stone's throw away from Mai Chau). Budget Red River tours can be commissioned through your Hanoi hotel, but for luxury tours, book one like the 11-day Red River tour offered by Pandaw Travel. 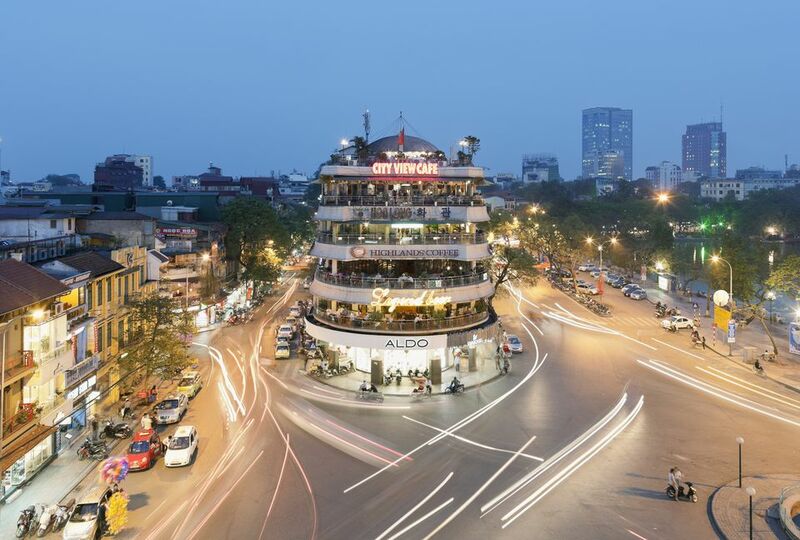 Visit Hoan Kiem Lake for Hanoi's history, but for culture and nightlife, head over to West Lake, the city's largest freshwater lake and nexus for the capital city's international-quality restaurants, ultra-hip bars, and exciting shopping finds. Along Duong Thuy Khue at the lake's southernmost point, seafood restaurants line the lakeshore, offering cheap seafood overlooking the waters. Travelers with a little more cash to burn can head north towards the Tay Ho expat enclave, passing by the Xuan Dieu strip of luxury hotels, shops, and restaurants. Visit West Lake on Saturday mornings and find the Tay Ho weekend market selling locally-crafted artisanal products like small-batch perfume and honey. If you're watching your calorie intake and your spending, take a walk or a bike ride around the lake instead; enjoy the view and stop by temples like the Tran Quoc Pagoda along the way. Not even an all-consuming fire in 1994 could dampen Dong Xuan Market's drive to sell, sell, sell. This imposing building north of the Old Quarter was founded in 1889, and even more than a century after its founding, it retains its place as Hanoi's biggest indoor market. The ground floor offers little to the foreign tourist except for atmosphere: the shops here cater mainly to locals, selling meat, vegetables, and seafood to haggling homemakers. The upper floor offers wholesale-price dry goods, including handicrafts and other souvenirs for tourists. The food hall lets you chow down on hearty local fare for mere pennies a meal. If the pickings feel a little slim, wait for the Hanoi Weekend Night Market that breaks out around Dong Xuan from Friday to Sunday nights: Its goods range from China-made knockoffs to beautiful handicrafts from the handicrafts villages beyond Hanoi's city limits.